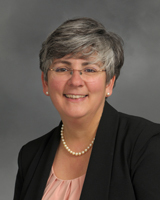 Maria Milazzo, RN MS is a Clinical Assistant Professor and Pediatric Nurse Practitioner. She is a proud graduate of Stony Brook School of Nursing and has been a member of the faculty since 2005. Her passion lies in caring for youth and families- with a special interest in working with youth with chronic illness. She balances this by practicing in a general community based pediatric practice, caring for children and families across the childhood years. Her work with youth with infectious and immune mediated disorders of the central nervous system led to the creation of the first Pediatric Multiple Sclerosis center in the country. Caring for a child with an unusual and unpredictable illness requires more than good medicine; it requires a community of people living and learning together. This led to the creation of a residential summer camp program, the only camp for youth with MS in the nation. Her clinical scholarship is focused on experiences of youth with a chronic illness, incorporating a disability studies framework. Ms. Milazzo builds upon her clinical experience with the specific cognitive, physical and psychological needs of youth into her teaching role to explore and identify strategies to meet the special learning needs of our students. She supports students as they develop skills of life-long learning. She teaches in the undergraduate and graduate programs, in areas related to pediatric nursing, cross cultural perspectives in nursing and social justice, as well as the international academic program in Tanzania. The experience of living with chronic illness and disability in childhood for youth and their families. In particular, the shared learning between youth, families and health care providers. Impact of a residential rehabilitation program for individuals with spinal cord injury. Krupp, L, Rintell, D, Charvet, L, Milazzo, M, Wassmer, E.  (2016). Pediatric multiple sclerosis: Perspectives from patients and their families. Neurology, 87 (Supp; 2), 4-7. Squillace M, Ray S, Milazzo M.  (2015). Changes in gross grasp strength and fine motor skills in adolescents with pediatric multiple sclerosis. Occup Ther Health Care, 29(1). Weisbrot, D, Charvet, L, Serafin, D, Milazzo, M, Preston, T, Cleary, R, Moadel, T, Seibert, M, Belman, A, Krupp, L.  (2014). Psychiatric diagnoses and cognitive impairment in pediatric multiple sclerosis. Multiple Sclerosis Journal, 20(5), 588-93. Weinfurtner, K, Graves, J, Ness, J, Krupp, L, Milazzo, M, Waubant, E.  (2014) Prolonged remission in neuromyelitis optica following cessation of rituximab treatment. Journal of Child Neurology, 30(10). Waubant, E, Mowry E, Krupp L, Chitnis T, Kuntz N, Ness J, Belman A, Milazzo M, Gorman M, Weinstock-Guttman, Rodriguez M, James J. (2013). Antibody response to common viruses and human leukocyte antigen-DRB 1 pediatric multiple sclerosis. Multiple Sclerosis, 19(7):891-5. MacAllister, WS, Christodoulou, C, Milazzo, M, Preston, T, Serafin, D, Krupp, L, Harder, L. (2013). Pediatric Multiple Sclerosis: What We Know and Where Are We Headed? Child Neuropsychology, 19(1), 1-22. Block P,  Rodriguez E, Milazzo M, MacAllister W, Krupp L, Nishida A, Slota N, Broughton A, Keys CB. (2011). Building pediatric multiple sclerosis community using a disability studies framework of empowerment. Research in Social Science and Disability, 6, 85-112. Waubant, E, Mowry EM, Krupp LB, Chitnins T, Yeh EA, Kuntz N, Ness J, Chabas D, Strober J, McDonal J, Belman A, Milazzo M, Gorman M, Weinstock-Guttman, B, Rodriguez M, Oksenberg JR, James JA, and for the US Pediatric MS Network. (2011). Common viruses associated with lower pediatric multiple sclerosis risk. Neurology, 76:1989-1995. Weisbrot DM, Ettinger AB, Gadow KD, Belman AL, MacAllister WS, Milazzo M, Reed ML, Serrano D, Krupp LB. (2010). Psychiatric comorbidity in pediatric patients with demyelinating disorders. Journal of Child Neurology 2010, 25, 192-202. Mowry EM, Krupp LB, Milazzo MC, Chabas D, Strober J, Belman AL, McDonald J, Oksenberg J, Bacchetti P, Waubant E.  (2010). Vitamin D status is associated with relapse rate in pediatric – onset multiple sclerosis. Annals of Neurology, 67, 618-624. MacAllister WS, Christodoulou C, Troxell R, Milazzo M, Block P, Bender HA, Belman A, Krupp LB. (2009). Fatigue and quality of life in pediatric multiple sclerosis. Multiple Sclerosis, 15, 1502-1508. “Kids don’t get MS”:  Creating meaning in a summer camp community. Society for Applied Anthropology. March 30, 2016. Vancouver, Canada. Model Programs for Spinal Cord Injury and Neurologic Disability. American Congress of Rehabilitation Medicine, 92nd annual meeting. October, 2015. Dallas, TX. Pediatric Multiple Sclerosis:  Cognitive, Fine Motor and Educational Impact. At the American Congress of Rehabilitation Medicine. October 10, 2014. Toronto, Canada. Multiple Sclerosis in the Pediatric, Adolescent and Young Adult Population. At the American Congress of Rehabilitation Medicine. October 8, 2014. Toronto, Canada. Caring for the Child-Family: Pediatric MS.  At the annual Janet Pierce Nurse Training Program. October 17-18, 2013. New York. Founder/Director of Teen Adventure Camp. A residential summer camp program for youth with Multiple Sclerosis. 2004-present. Hope award. International Organization of Multiple Sclerosis Nurses. 2006. Sigma Theta Tau International Honor Society, 1989-present.